It's easy to add agents to BrokerSumo. Each agent you add is given access to their own Agent Portal account where they'll have access to their profile information. There are two ways to add agents to your BrokerSumo account. The first is to enter their information yourself. Click on Agents > Add Agents on the side menu and then select the I Will option. You'll be prompted to enter their name, email address and assign them to a commission plan. Once you've entered that data, they are active in the system. The other way is to send your agent an onboarding package. For this option you'll choose Agent Will from the options above. This allows you to create a package of information you want to collect from your agent. You will be prompted to choose either a current onboarding template you have created or choose Create New Template. If want to create a new template with Docusign documents to be signed, or make changes to an existing Docusign template you'll need to go to Settings > Onboarding Templates to create or edit the template. Once you've created or edited the template you can then send it out from this section. you can upload PDF documents that you want your agents to sign. They'll be required to sign them using our Docusign integration during the onboarding process. Then you can choose which PDF documents you would like to send to agents by checking the box next to the document name, and upload new ones. You also can choose a co-signer from this page as well, if you would like to have a co-signer sign the documents. You can also request specific pieces of information to be added and uploaded to the system. At this time, these 5 items are set as a default and cannot be customized. Click next and you'll be prompted to enter their name, email address and assign them to a commission plan. 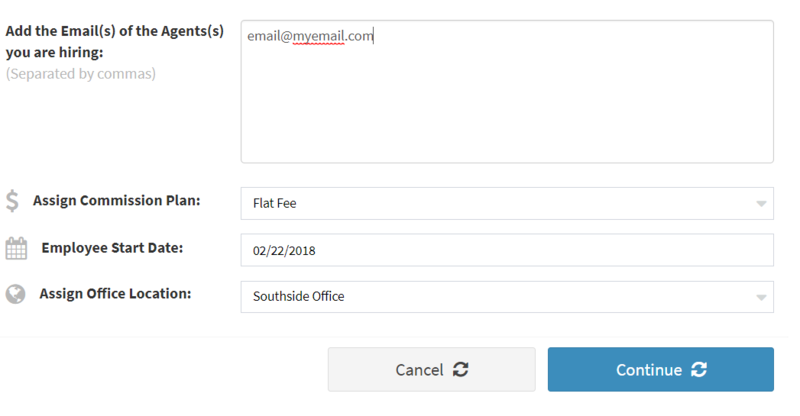 When you save and close you will be taken to the Customize email page to create a customized email to your agents welcoming them to the agency. Once you click send invite it will take you to review the onboarding package page, this will show you what items and documents you are requesting the agent to complete. 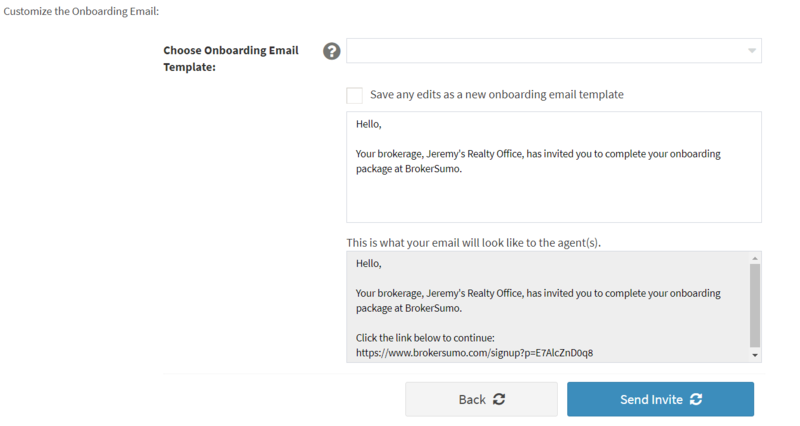 When you click Send Onboarding you agents will be emailed a link to sign into BrokerSumo and complete the onboarding package. When you send an agent an onboarding package, they'll log into their BrokerSumo Agent Portal account and the system will walk them thru each step one-by-one to complete their required info. The video below will walk you through the agent's experience when they are completing an on-boarding package. Once the onboarding package is complete, the agent's information will be accessible within their profile in your brokerage account and it will be accessible to the agent in their Agent Portal account.